Digital disruption is happening across industries (agriculture is no longer an exception!) bringing significant values to individuals and organizations. We are spotting disruptive trends in commerce, health, hotel, governance, banking industries, but have seldom tried to relate them to rural advisories and agricultural development. What could be done to leverage the strengths of digital disruption requires a bit of analysis. 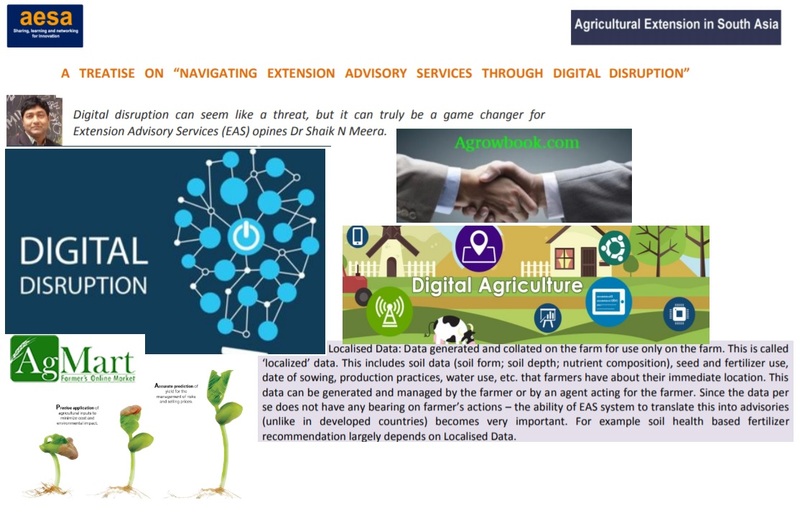 The blog A TREATISE ON “NAVIGATING EXTENSION ADVISORY SERVICES THROUGH DIGITAL DISRUPTION”, by Shaik N.Meera - in AESA (Agricultural Extention in South Asia), October 2018 - is about this. 2. Start-up Digital disruption - where do we stand?